It’s been two years since moviegoers & longtime Star Wars fans have anxiously waited to see Luke Skywalker take his lightsaber from Rey. With most fans remaining overwhelmingly hyped because of how much of a powerhouse Luke Skywalker was in the Legends series & old video games, you could see how & why the anticipation for Star Wars: The Last Jedi was higher than its predecessor. However, did the film truly live up to the hype, or was this a letdown. Star Wars: The Last Jedi picks up right after Star Wars: The Force Awakens left off. 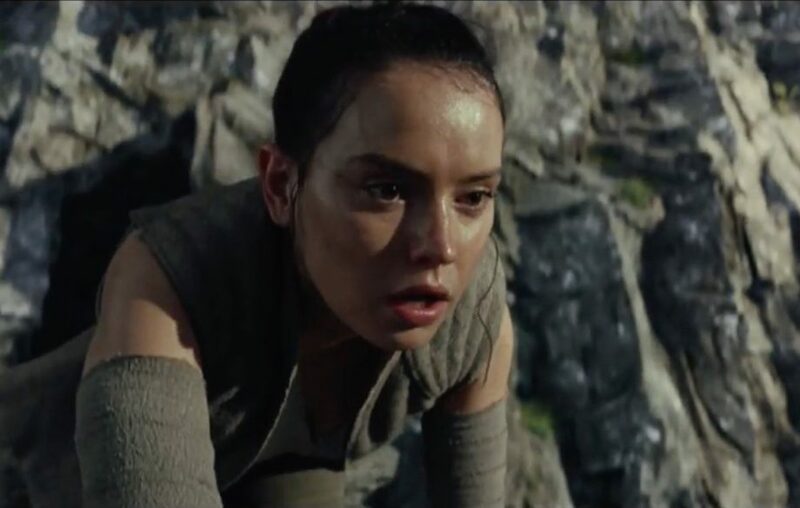 The Rebels are being pushed into a corner by The First Order, while Rey (Daisy Ridley) is trying to convince Luke Skywalker (Mark Hamill) to train her to awaken her dormant force abilities. The film surprisingly doesnt center much on Luke & Rey but also introduces a somewhat entertaining but draining story with Finn (John Boyega) & Rose (Kelly Marie Tran). We get to see more from Leia & Poe & a setup for Poe’s potential future in the last film. We barely get to see anything worth cheering over from Kylo Ren & Snoke. If you’re going into this film thinking you’re going to get some big reveal of who Snoke is, you’re setting yourself up for a huge letdown. Rian Johnson took some major risks with this film & most of those risks are what ultimately weighed this film down to a new low. Not only did the risks wipe the slate clean of major characters, but they also caused character development to waver with some major characters. One would think that having Luke back in the series would be major & exciting, but Luke was reduced to being a grumpy old man with a hit or miss sense of humor. In fact, Luke’s character was a heavy mix of Yoda & Obi-Wan Kenobi & Johnson couldn’t hide this fusion of characters from the audience that were familiar with the previous films. I say this with a sad heart but Luke Skywalker was wasted. The only solid thing he did that had fans hyped up was at the last 15mins of the movie & even the hype built around that scene was negated by what followed. Rey felt like more of a side character than a character that was on the rise of becoming a fixture in the future of the Jedi. This isn’t to say that Rey wasn’t in the film a lot, but I am saying that she didn’t grab my attention as much as other characters did. Luke used the force to project an image of himself at the Rebel hideout, where he had one of the best scenes in the movie where he was shot at by the Heavy Assault Walkers & survived. After that scene, he “fought” Kylo & died & became one with the force. Snoke (Andy Serkis) was swept to the side without showing much character development, which is a huge disservice to the character. Snoke started off on a high note & sadly was made irrelevant by the end of the film. I mean, there’s a scene in the beginning not the film where Snoke uses the force to grab Hux, so the audience is shown just how powerful Snoke truly is, but he & the audience get shortchanged towards the climax of the film. Armitage Hux (Domhnall Gleeson) went from being this serious & dreadful character in The Force Awakens to being somewhat comedic in The Last Jedi. Did it work? Yes. But I just hope J.J. Abrams knows which Hux he’s going to use to end the trilogy on. Kylo Ren kills Snoke by using the force to grab Luke’s lightsaber which is next to Snoke & slicing Snoke in half. Finn is still the goofy, one direction character in this film & walks without a backbone. His story with Rose felt unnecessary & forced. The two characters knew each other for a few hours & by the end of the film, have a budding relationship that will surely pour over into the next film. It was interesting to see what how Poe developed from The Force Awakens to The Last Jedi. Poe is definitely being setup to become a lesser of the resistance & it feels right. I will also go on to say that Poe was another standout character in this film that doesn’t have a forced story. Another down moment in the film was that Captain Phasma (Gwendoline Christie) barely had any moment to shine in the film, & when she finally got the chance to shine in the story, she was dismissed in an unfavorable manner. Vice Admiral Amilyn Holdo (Laura Derm) & DJ (Benicio Del Toro) were forgettable & didn’t really hold a strong presence in the movie. Vice Admiral Amilyn Holdo’s scenes with Poe, where they clashed over tactics being used to save the resistance were her only standout moments. However, if you feel like her character was developed long before this film, it’s because she appeared throughout the Leia book written by Claudia Gray. As for DJ, he was just there to deliver a political message to the audience & was a character that was absolutely in the vein of Lando Calrrisian. TheLast Jedi did have some solid moments that were visible but lacked the punch needed to save this film. The comedy might’ve been too much for most moviegoers, but I found some of the scenes that contained heavy comedy worked well. Star Wars isn’t known for its comedy, but I believe Johnson did a solid job incorporating heavy comedy into this film. Overall, The Last Jedi is a big disappointed & did not deliver on the high note it should’ve ended on. Being that this is is the second film in the trilogy, it’s going to be hard for Abrams to recover & land on solid ground with the last film. The force was not strong with this film.